So here we all sit, waiting out the worst ammo shortage since WWII, terrified to even think about going to the range to shoot up what could be the last box of ammo we may see in the next month, two, or more. What to do, what to do... pellets are still on the shelf for the most part, but that would not allow you to practice with your real firearms. Amidst the empty ammo shelves, I saw the LaserLyte Reaction Trainer Targets which allow you to practice anytime, anywhere, all without burning a round of ammo. The technology in the Reaction Tyme Trainer Targets are pretty sophisticated, but LaserLyte’s execution delivers an elegantly simple package. After batteries are installed in the two targets, pop a laser insert into the barrel of an unloaded firearm and you can start blasting the interactive Reaction Tyme Training Targets with your real firearm. 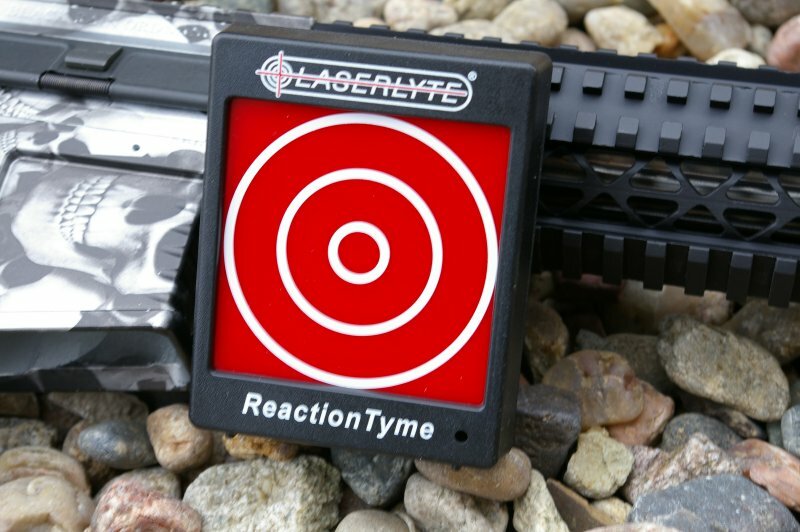 To utilize the LaserLyte training system, you need two products, both the Reaction Tyme targets and a laser insert which are both purchased separately based on your firearm's caliber. The targets are durable black plastic housings which seem to handle a drop just fine. 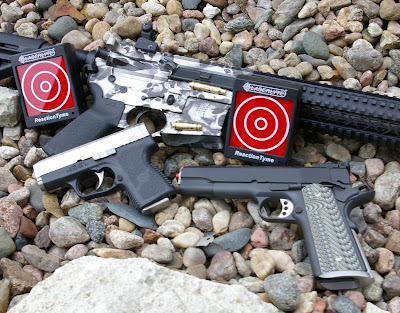 At approximately 3" x 4", the Reaction Tyme Targets are compact and light enough to stash in a shooting bag for use at the range for ammoless training. 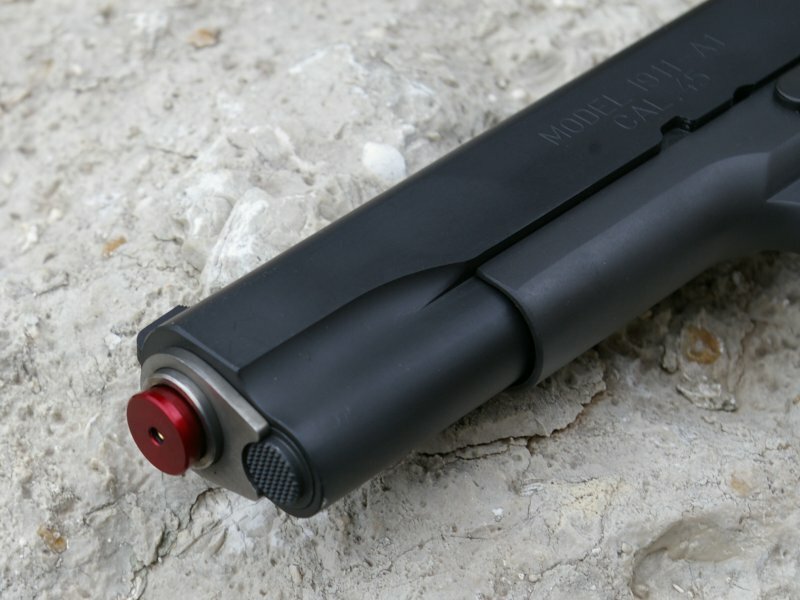 The Universal barrel insert slips into the muzzle end and secures with an expanding plastic plug which expands somewhat like a drywall anchor, all be it a bit more elegantly. The other inserts us a single or double O-ring design similar to what LaserLyte uses on their boresight products. Each of the inserts are beautifully turned billet aluminum and then hard anodized. 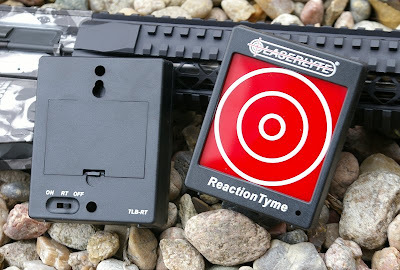 The Reaction Tyme Target system includes two targets which operate in two modes. In the Training/Manual Mode to indicate shots which briefly show the laser splash on the target and "celebrates" hits with two beeps and a LED flash. The other setting is Reaction Mode which randomly lights the LED in 3-7 second intervals to work on your reaction shooting. It is important to note that this is a professional quality training system and not a shooting game. Admittedly it took about four shots before my wife and I were betting nickels on who was the better shot, however there are far less expensive toy shooting games out there. This system is designed from the ground up as a professional system which I was able to get the targets to record hits all the way out to about fifteen yards. From an operational perspective, the targets work independently and do not record or playback shooting hits (LaserLyte has another training target product for that). 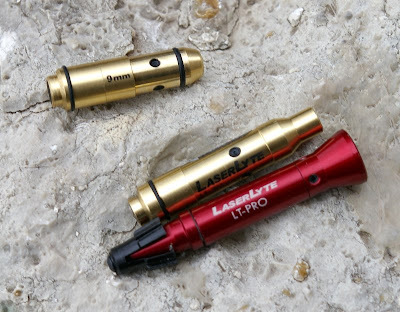 The LaserLyte Laser Trainer Cartridges insert into the barrel like any bullet would, but are held in place with the o-ring(s) and do not eject when the bolt/slide is cycled. Once practice is complete, a cleaning rod can be used to knock out the insert. I picked up the 9mm and .223 Remington versions. The momentary laser is triggered by the firing pin hitting the integrated snap cap in the cartridge and consequently works 100% reliably and I found more closely matched the actual point of aim of the pistol or rifle. Testing in my Houlding Precision and Black Rain Ordnance, I did need to find the clocking point which aligned with my rifle's zero. For longer shots, I found a need to also clock the 9mm to adjust the point of aim on longer shots. Both the 9mm and .223 inserts seem to have a greatly extended battery life over the Universal insert. Unfortunately that same reliability statement cannot be said for the LT-Pro Universal Pistol Trainer insert which is the insert for pretty much any pistol caliber. The LT-Pro works on a sound detection system which about 25% of the time seems both too sensitive and not sensitive enough. The LT-PRO triggered just by handling and usually cocking a revolver, but problems occurred with heavy revolvers shooting in single action and tighter 1911 pistols, such as my Ruger GP100 and Springfield Range Officer. My Ruger SR1911, pocket pistols, and lightweight snubby revolvers all worked fine, however it seemed that there was just not enough sound or vibration from the hammer drop to trigger the unit reliably in tight fitting and/or heavy pistols. IN some cases I have to fiddle with the LT-Pro to make sure it was not too loose or too tight in the barrel or it would not record shots. The Universal Pistol Trainer Insert for me seemed to deliver laser strikes about 75% of the time which is liveable and still very useable for me as a universal unit I can stick in any pistol. One of the somewhat painful procedures of use was that the Universal Model is "always on" until you unscrew the battery compartment and reinstalling the tiny little batteries correctly is a wee bit frustrating. The biggest advantages of this system are that you can use your real actual firearm for training which I consider a huge plus and “the” feature of the LaserLyte system. With both the universal insert and the cartridge inserts, draws from the holster are possible, however I would buy the dedicated cartridge insert for this activity. Paired with both Reaction Tyme Targets in Random/Reaction mode, this draw and fire drill can keep you hopping. Whether you actually use the system to train or to have a little fun while watching TV at night, this is a highly valuable system for training to see your trigger control, to minimize your flinching, improve sighting and target acquisition, and practice your holster to target hits. The system also lets you attempt training which would be potentially unsafe with live ammo or begin training with a new shooter in a safe comfortable environment. Mrs. Pandemic and I positioned the targets at strategic corners and choke points within the house to practice forced entry defensive response scenarios and also used the targets for draw, charge, shoot drills for our concealed carry guns. We of course used them with our feet up shooting targets in front of the TV as well to "practice trigger control". 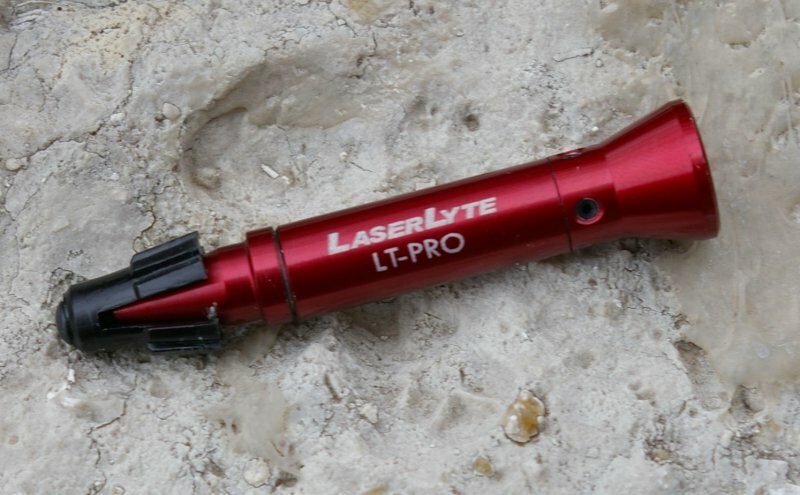 With around $300 invested to start up the LaserLyte training system including the targets and an insert, the question is it worth it? A resounding yes, especially at today's ammo prices. Even with the picky nature of the Universal Insert, this is still a great training system which pays for itself really quick and allows you to safely target practice in your home any time. With the cartridge inserts practice is blissfully problem free and much more closely matches the actual point of aim. This system paid for itself quickly and kept me from going completely nuts during this US ammo shortage. I have used the system in a number of ways, all of which have helped me develop skill, shoot my beautiful firearms, and fight boredom. For the price of fifteen boxes of ammo, this is a no brainer training system for any shooter which will be a valued firearm training tool for many years. Weight: 4.25 oz. / 119 gr. this system would be much more useful if the if the timing could control down to 1 second rather then a random 3 to 7 seconds. A good shooter should be able to hit the target in under 1.5 seconds from the holster. I am assuming that the shot counts as a miss if the target is hit when the target is not illuminated, if not then the system is only a marginal training system.